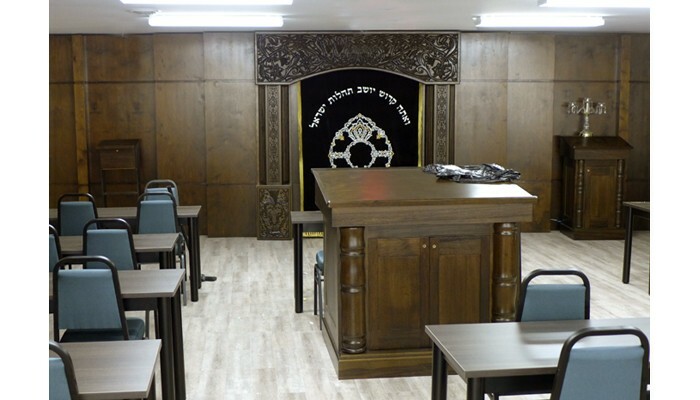 This remarkable synagogue project was installed in May 2014 in Toronto. 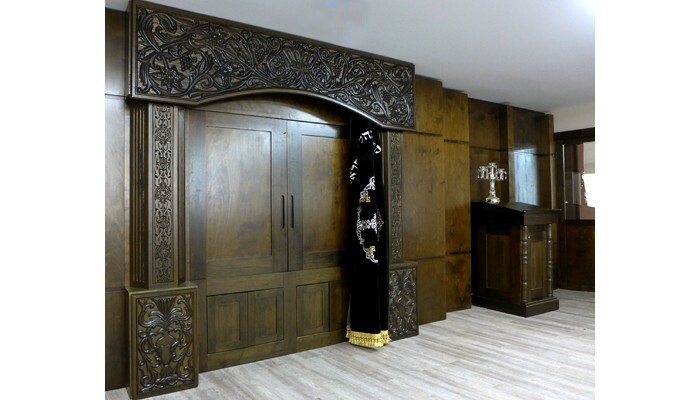 The entire synagogue, including the aron kodesh, bimah, amud, walls, mechitza/door openings, and library were designed, produced, and installed by Gabriel Bass, Tal Leibman, and other assistants. 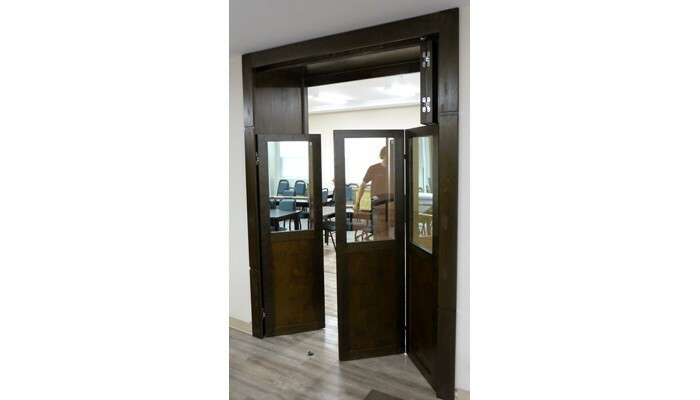 The entire fronts, doors, and framing were all made from solid wood, African Walnut with dark finish, integrating a traditional design with contemporary feel. 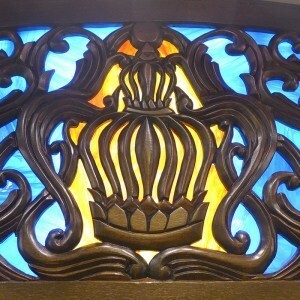 Gabriel carved the entire aron kodesh by hand in traditional recessed relief, the flow of the natural floral patterns emanating from the crown above. 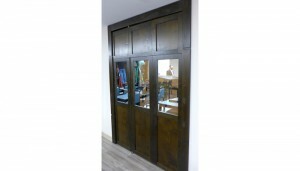 The four spaces between the men’s and women’s section doors were designed to be used as both a mechitza and room dividers. 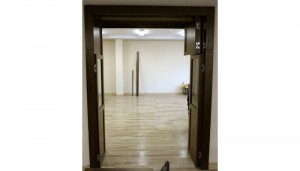 Women can see into the sanctuary through a one-way mirror and the top hanging doors can be left open to allow sound to travel in. 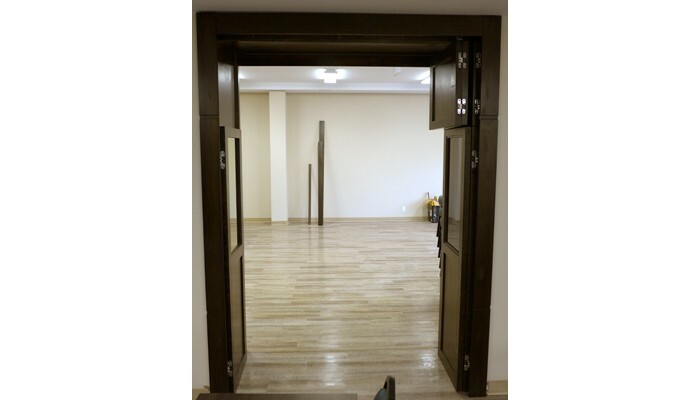 The top can be closed completely to section off the two rooms when used separately and the doors can be opened completely for larger gatherings. 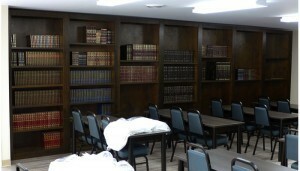 Eight matching synagogue bookshelves make up the library, framed in the same pattern as the aron kodesh and mechitza openings. 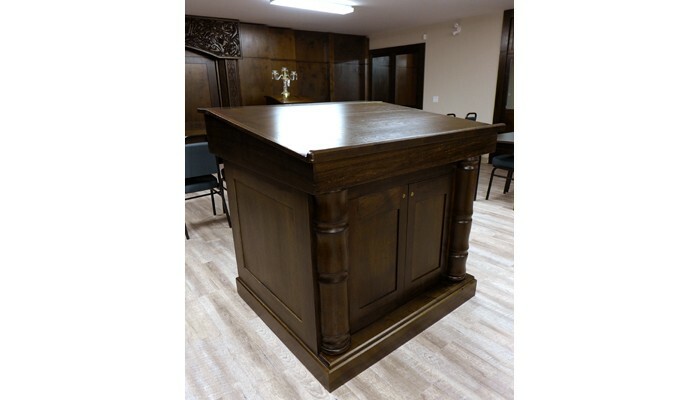 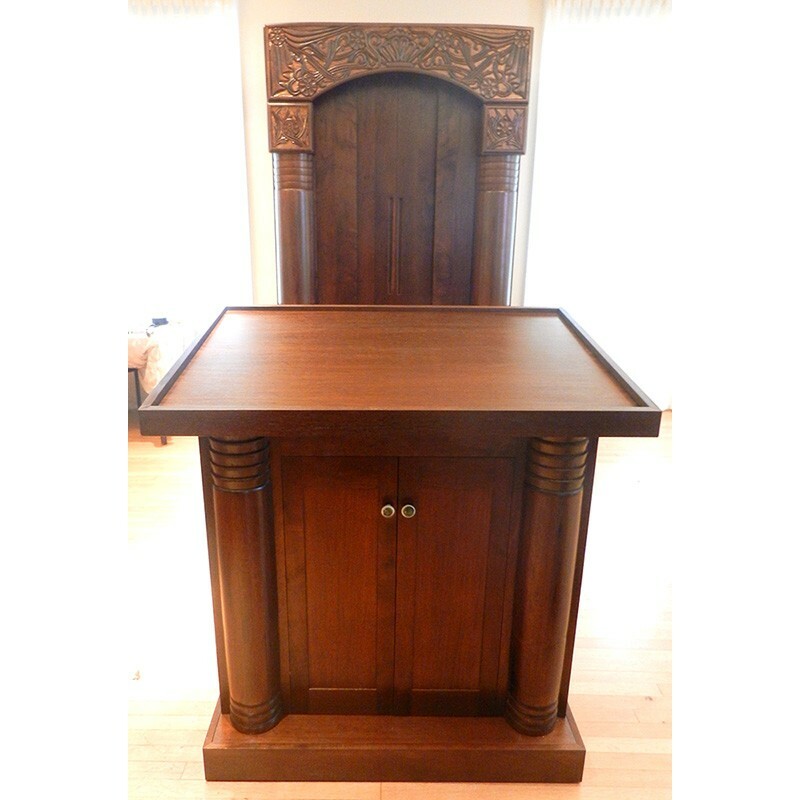 Each aron kodesh is custom built according to your specifications, measurements, and stain choice. 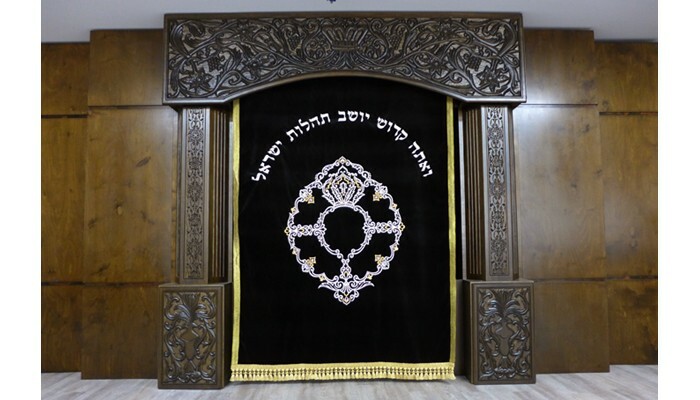 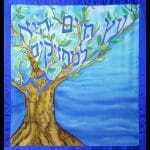 How to simply customize your aron kodesh? 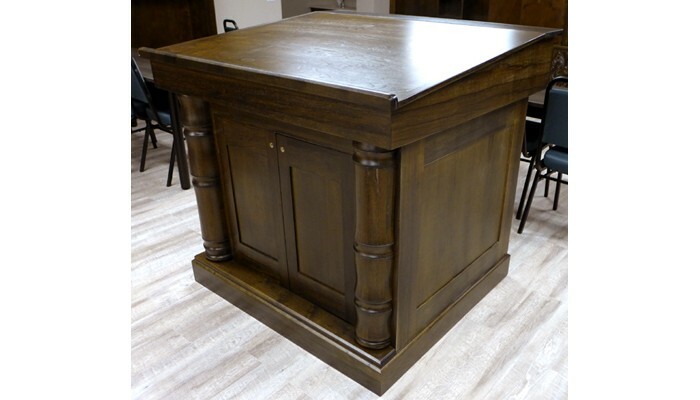 Send us an email to [email protected] or fill out the contact form on the website, with the following information and any questions you may have for your free estimate. –How many torahs do you need it to hold? -Will it be permanent, built-in, or portable? If portable, how often and far will it need to be moved? 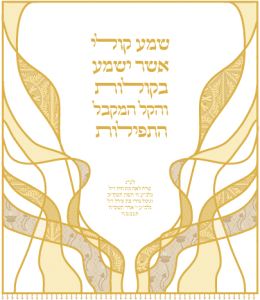 -Will you want a matching Ner Tamid? 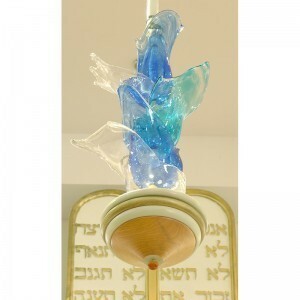 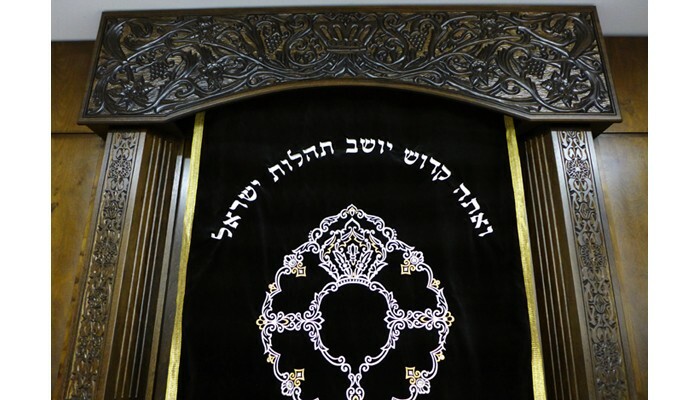 Bass Synagogue Furniture features ner tamids that can be hung from the ceiling above/ in front of the aron kodesh or custom made to mount onto the top of the ner tamid like a crown. 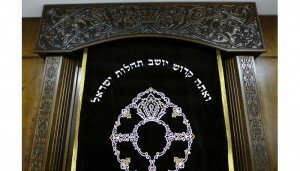 -Would you like to order a parochet as well. 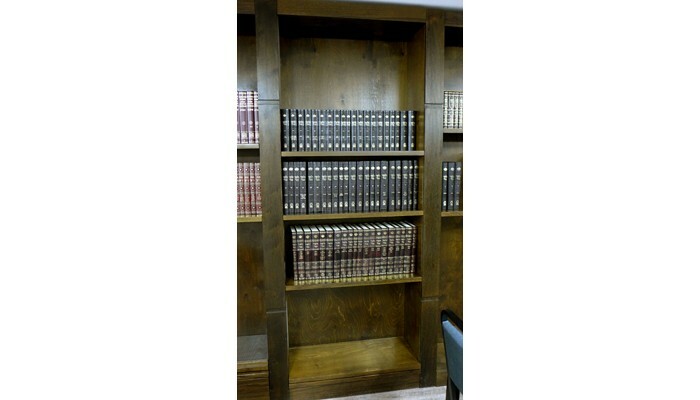 We offer custom parochets, which we design together with our clients and the appropriate producer. 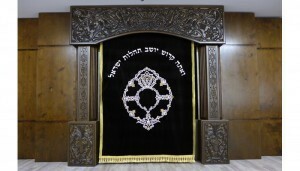 We work with traditional velvet embroidered styles and also work intimately with fabric artistist. 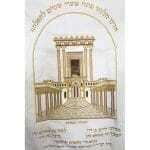 Offering a variety of techniques, we can find the most suitable design for your aron kodesh. 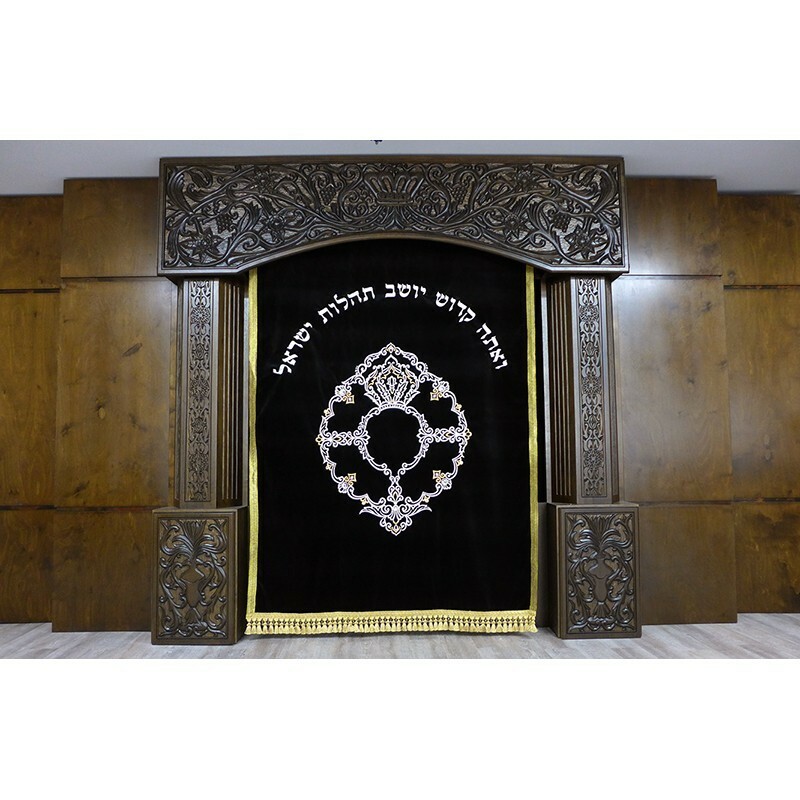 For more information regarding our contemporary parochet designs. 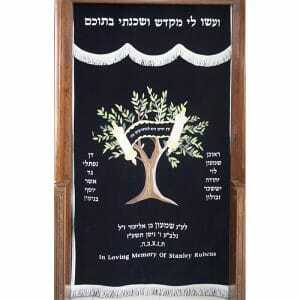 For more information regarding our traditional parochet designs. 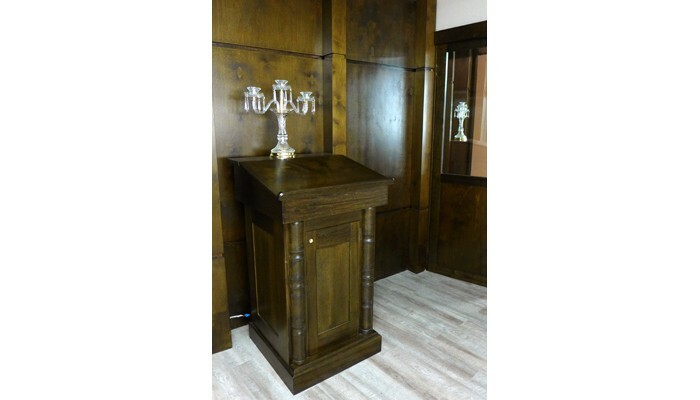 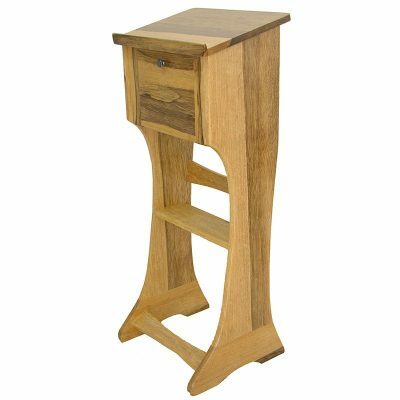 -Choose the Wood Finish: Mahogany, Dark Walnut, Natural Golden Oak, Warm Brown or custom stain to match your existing furniture? 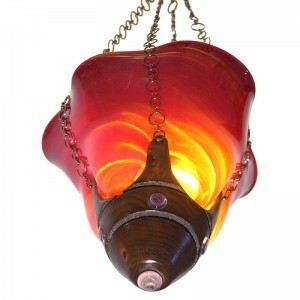 Many of the available aron kodeshes and any matching furniture can also be stained in your choice of the follow stains. The stain can also be matched to suit your existing interior furniture. -Are there any other furnishings you need at this time? 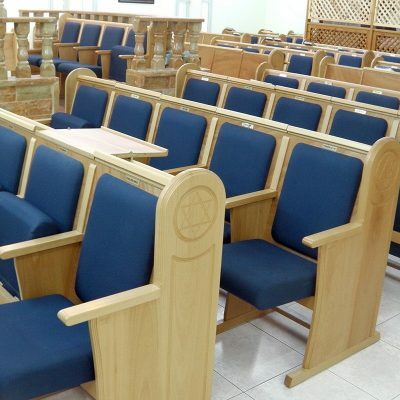 It is always useful to design the aron kodesh first, but it is most efficient to order other furnishings at the same time. 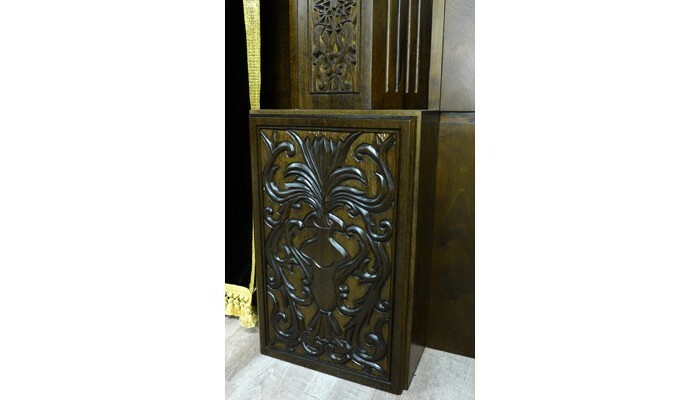 This way, all the materials are ordered together for uniform materials, everything can be finished at the same time for consistency in tone, and we save you money on shipping. 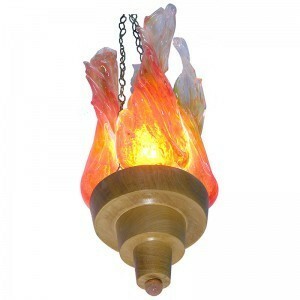 Depending upon the size of the project you may available for further discounted prices.